杨慧, 路文睿, 李虹杨, 等. 基于工程转捩模型的高超声速进气道特性[J]. 北京航空航天大学学报, 2018, 44(7): 1408-1418. YANG H, LU W R, LI H y, et al. 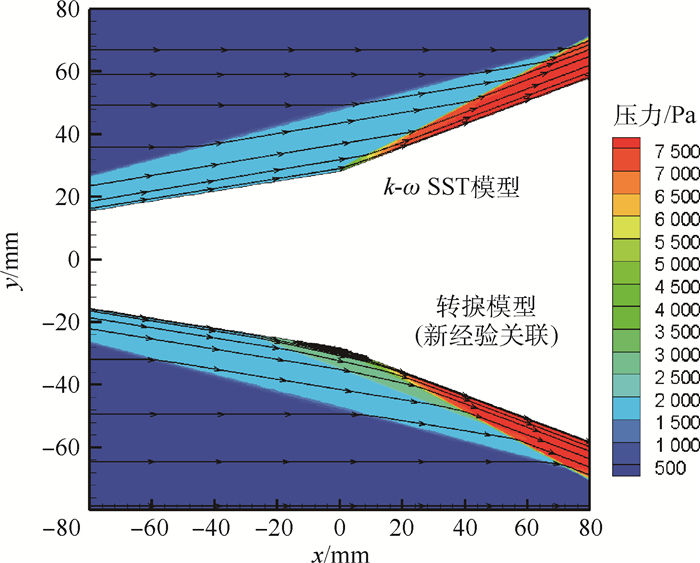 Hypersonic air inlet performance based on engineering transition model[J]. Journal of Beijing University of Aeronautics and Astronsutics, 2018, 44(7): 1408-1418. 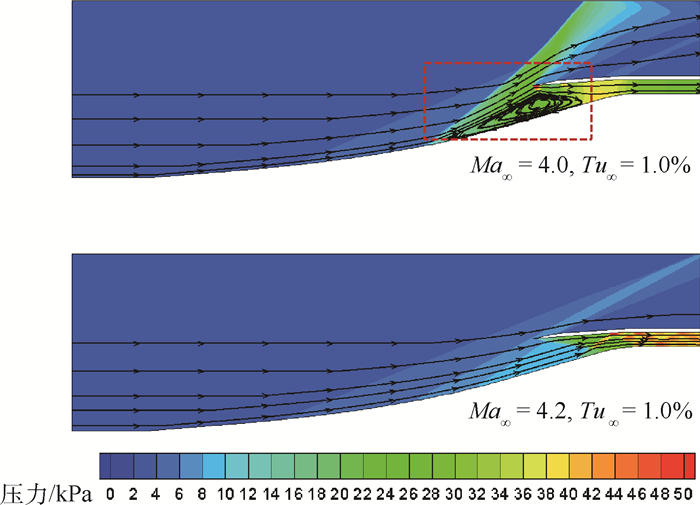 Abstract: In order to study the variation of the performance parameters of a hypersonic air inlet with the flight height, free stream turbulence intensity and free stream Mach number, and the influence of the boundary layer transition on the compression surface on air inlet performance, a series of numerical simulations were conducted by using the γ-Reθ transition model developed in a in-house HGFS and the flow phenomena and mechanisms were analyzed. 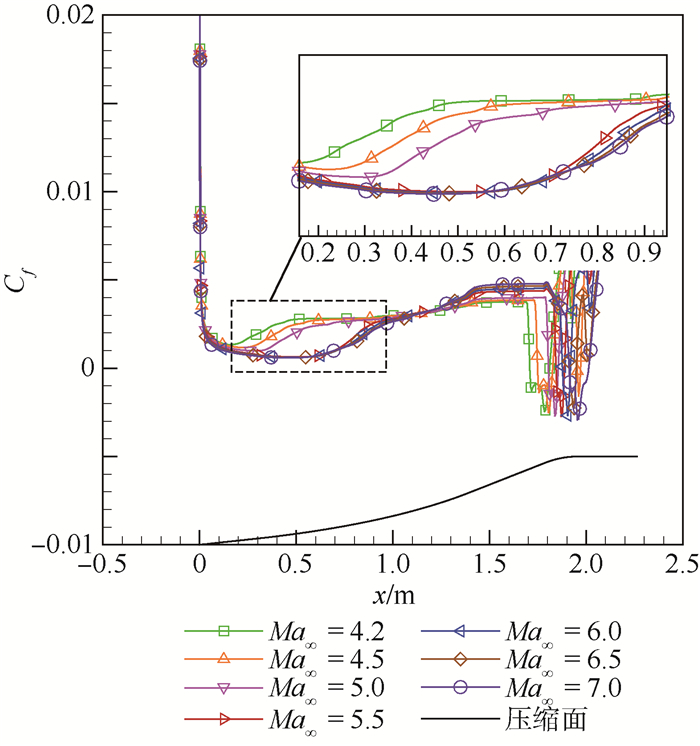 Firstly, the improved γ-Reθ transition model implemented in the HGFS code was verified using a simplified model of an air inlet compression surface. Secondly, a hypersonic air inlet with isentropic compression surface was studied the effect of flight height and Mach number on parameters such as the transition location. 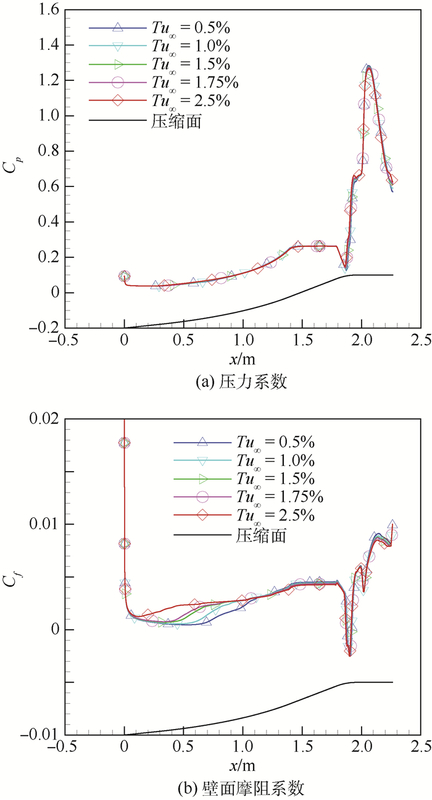 Main conclusions are as follows:with the increase of the flight height, transition location of the boundary layer moves downstream on the compression surface, and the total pressure recovery coefficient decreases. 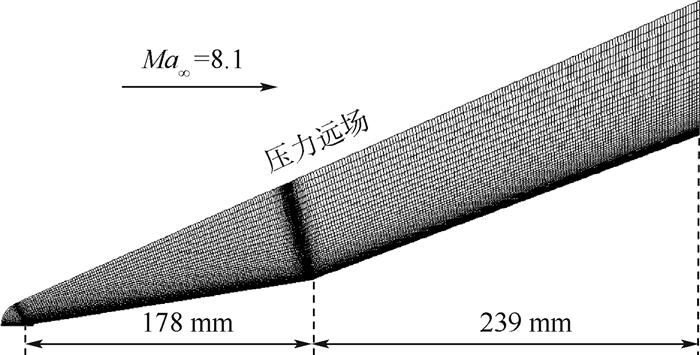 Compared with the ground surface state, at the design flight height, the transition location moves downstream for about 0.525 m, the boundary layer thickness increases by about 73%, and the total pressure recovery coefficient decreases by 3.2%. About 0.5% magnitude change of the inflow turbulence intensity will contribute to 0.2 m movement of the transition location. 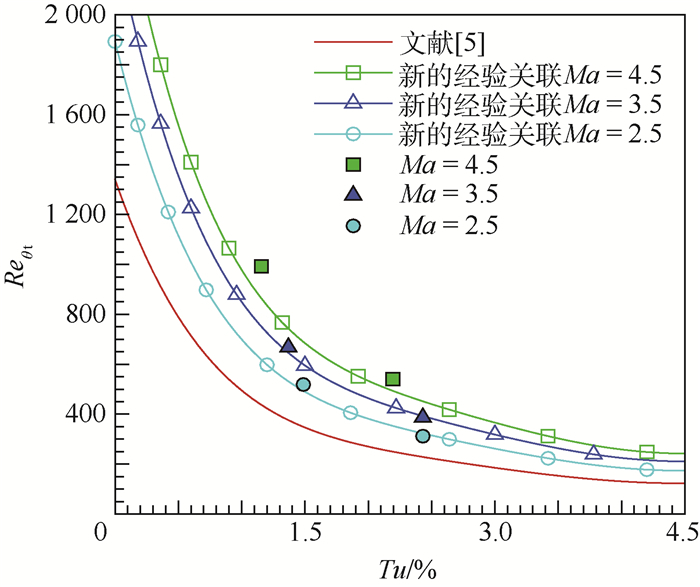 However, the influence of turbulence intensity on the total pressure recovery coefficient is quite small. 黄伟, 罗世彬, 王振国. 临近空间高超声速飞行器关键技术及展望[J]. 宇航学报, 2010, 31	(5): 1259–1265. 李祝飞. 高超声速进气道起动特性机理研究[D]. 合肥: 中国科学技术大学, 2013: 1. 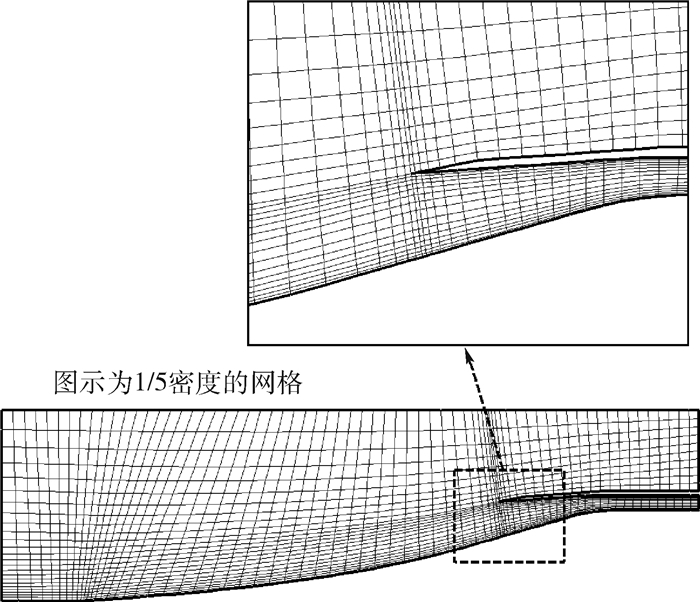 LI Z F. An investigation on starting characteristics of hypersonic inlets[D]. Hefei: University of Science and Technology of China, 2013: 1(in Chinese). 张玉伦, 王光学, 孟德虹, 等. γ-Reθ转捩模型的标定研究[J]. 空气动力学学报, 2011, 29	(3): 295–301. 许丁, 马晖扬. 高超声速边界层工程转捩模式研究[J]. 中国科学院研究生院学报, 2009, 26	(1): 43–49. MENTER F R, LANGTRY R B, LIKKI S R, et al. 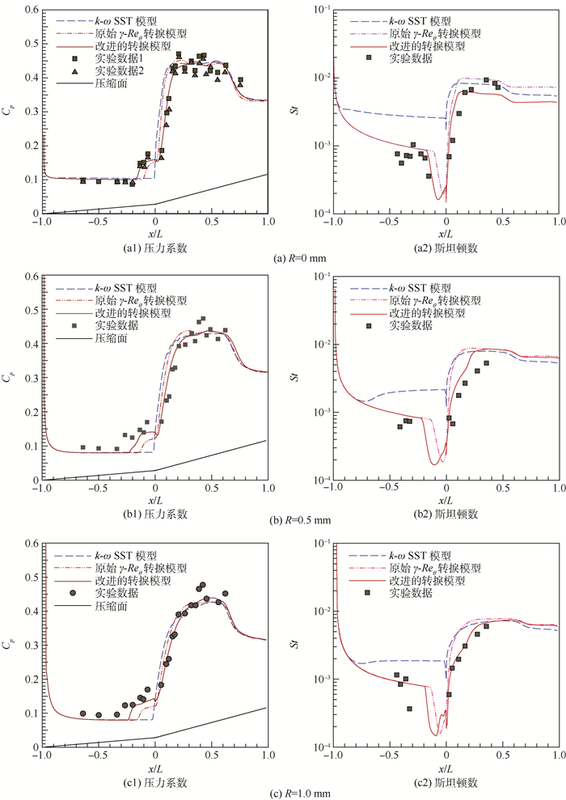 A correlation-based transition model using local variables:Part Ⅰ:Model formulation[J]. Journal of Turbomachinery, 2006, 128	(3): 57–67. LANGTRY R B, MENTER F R, LIKKI S R, et al. 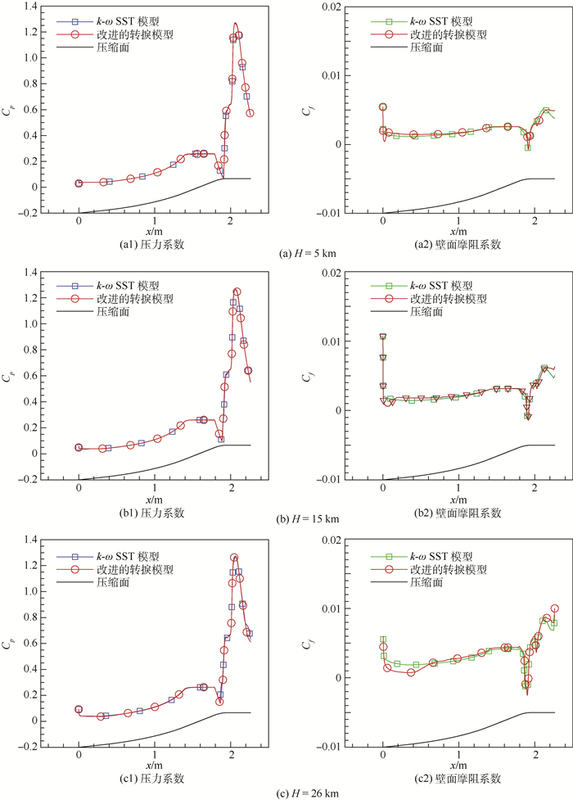 A correlation-based transition model using local variables: Part Ⅱ: Test cases and industrial applications: GT-2004-53454[C]//ASME Turbo Expo 2004: Power for Land, Sea, and Air. New York: ASME, 2004, 4: 69-79. MALAN P, SULUKSNA K, JUNTASARO E. Calibrating the γ-Reθ transition model for commercial CFD[C]//47th AIAA Aerospace Sciences Meeting including the New Horizons Forum and Aerospace Exposition, Aerospace Sciences Meetings. Reston: AIAA, 2009. 陈奕, 高正红. γ-Reθ转捩模型在绕翼型流动问题中的应用[J]. 空气动力学学报, 2009, 27	(4): 411–418. 钟伟, 王同光. 转捩对风力机翼型和叶片失速特性影响的数值模拟[J]. 空气动力学学报, 2011, 29	(3): 385–390. 郑赟, 李虹杨, 刘大响. γ-Reθ转捩模型在高超声速下的应用及分析[J]. 推进技术, 2014, 35	(3): 296–304. 孔维萱, 阎超, 赵瑞. γ-Reθ模式应用于高速边界层转捩的研究[J]. 空气动力学学报, 2013, 31	(1): 120–126. BENSASSI K, LANI A, RAMBAUD P. Numerical investigations of local correlation-based transition model in hypersonic flows: AIAA-2012-3151[R]. Reston: AIAA, 2012. 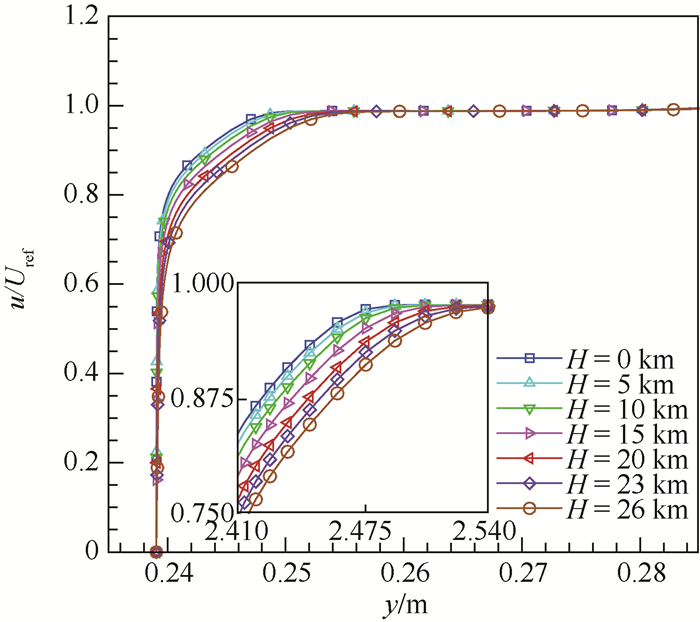 CHENG G, NICHOLS R, NEROORKAR K, et al. 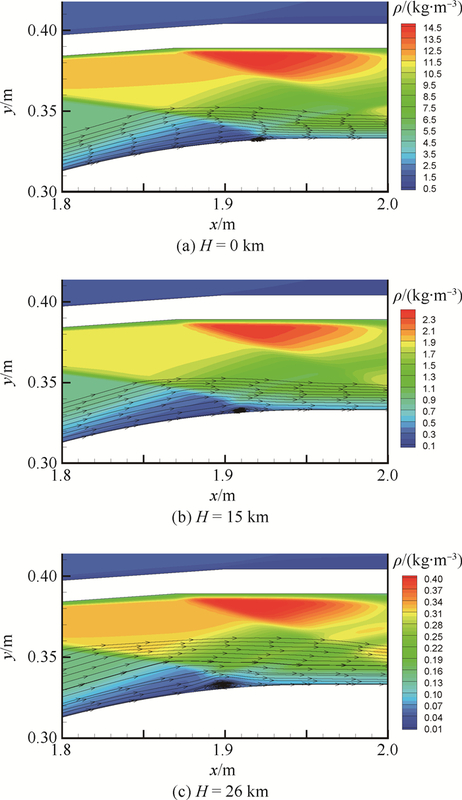 Validation and assessment of turbulence transition models: AIAA-2009-1141[R]. Reston: AIAA, 2009. 张毅锋, 雷净, 张益荣, 等. 高超声速数值模拟平台转捩模型的标定[J]. 空气动力学学报, 2015, 33	(1): 42–47. 张毅锋, 何琨, 张益荣, 等. Menter转捩模型在高超声速流动模拟中的改进及验证[J]. 宇航学报, 2016, 37	(4): 397–402. YOU Y C, LUEDEKE H, EGGERS T, et al. 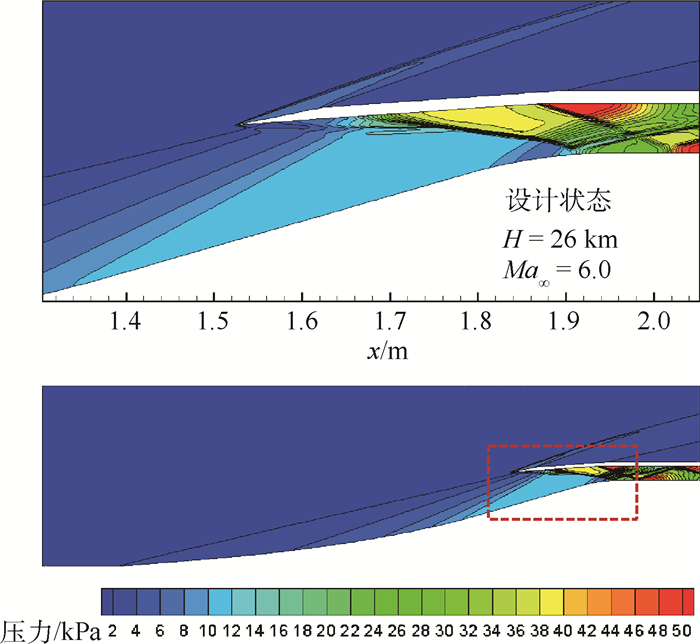 Application of the γ-Reθ transition model in high speed flows[C]//18th AIAA/3AF International Space Planes and Hypersonic Systems and Technologies Conference. Reston: AIAA, 2012. 夏陈超, 姜婷婷, 郭中州, 等. 压缩性修正对γ-Reθ转捩模型的影响研究[J]. 空气动力学学报, 2015, 33	(5): 603–609. 郑赟, 李虹杨. 基于新的经验关联公式的γ-Reθ转捩模型在高超声速流动中的应用[J]. 推进技术, 2015, 36	(6): 839–845. DENISSEN N A, YODER D A, GEORGIADIS N J. Implementation and validation of a laminar-to-turbulent transition model in the wind-us code: NASA/TM-2008-215451[R]. Washington, D. C. : NASA, 2008: 27. 李虹杨, 郑赟. 尾迹对涡轮叶栅边界层转捩的影响[J]. 推进技术, 2017, 38	(3): 532–538. LI H Y, ZHENG Y. Effect of surface roughness on conjugate heat transfer of a turbine vane: GT-2016-56744[C]//ASME Turbo Expo 2016: Turbomachinery Technical Conference and Exposition. New York: ASME, 2016: V05AT13A012. NEUENHAHN T, OLIVIER H. Influence of the wall temperature and the entropy layer effects on double wedge shock boundary layer interactions[C]//14th AIAA/AHI Space Planes and Hypersonic Systems and Technologies Conference. Reston: AIAA, 2006. REINARTZ B, BALLMANN J. Computation of hypersonic double wedge shock/boundary layer interaction[C]//26th International Symposium on Shock Waves. Berlin: Springer, 2008: 1099-1104.